The companies involved in trucking and moving services can be a great marketplace for organizations and business personnel who provide services that can help them run and function properly. If you are one among such service providers, Blue Mail Media can help you build the most significant market base for your business. We offer Trucking, Moving & Storage Mailing List that includes the contacts of organizations and business professionals dealing in trucking, moving, and storage services. These services include general merchandising, moving household furniture or office equipment, and so on. 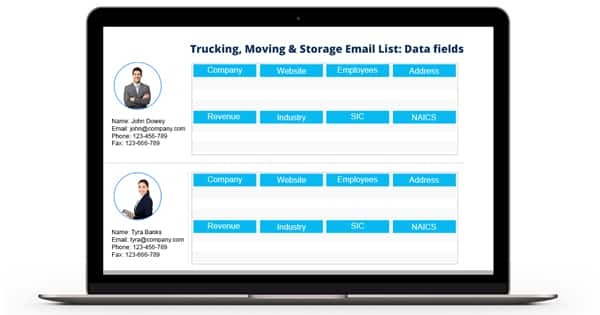 If you desire to find new business opportunities in the Trucking, Moving & Storage industry; Blue Mail Media’s Trucking, Moving and Storage Email Database can be the best asset for you. We have a team of marketing analysts and data experts that collects the contact records in this list by using the most reliable sources like business directories, exhibitions, and seminars. This database encompasses verified email and telephone addresses of the Transporters, Transportation Engineers, Transportation Executives, CIOs, CTOs, and others. Now, reach the most potential prospects in the Trucking, Moving & Storage industry across the world successfully.